Just after the Fitness Show last weekend, mum and I decided to head to V Burger Bar for lunch at Floreat Forum so we could use our Entertainment Book voucher. I have heard many good reviews of V Burger Bar and thought that it was perfect to give it a try. There are two V Burger Bar restaurants in Perth. One in Victoria Park and another one close to my place which is in Floreat Forum. It was a bit hard to decide what to order as the choices on the menu looks yummy! At the end, I settled for the F.B.A. (Full Blooded Aussie) ($14.50). The F.B.A. 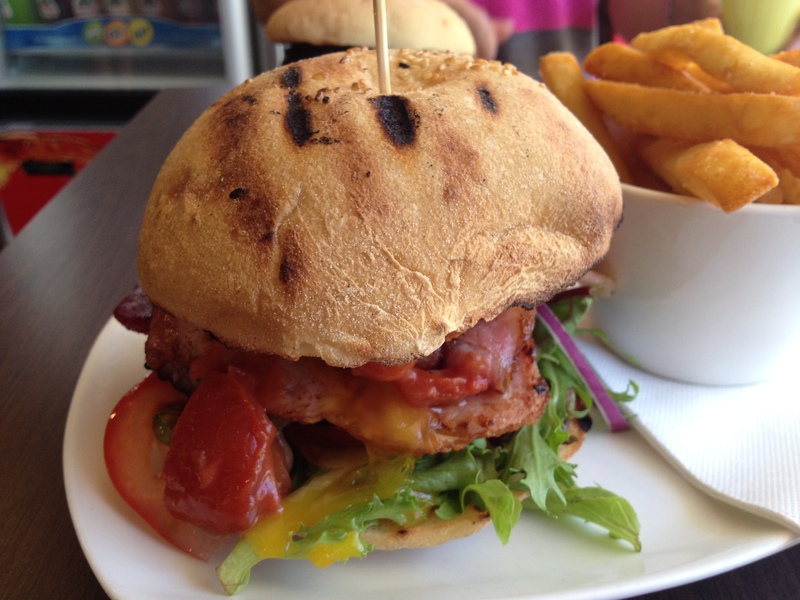 is one of the classic V burgers which consists of melted cheddar, bacon, fried egg, sliced beetroot and barbecue sauce. The F.B.A was deliciously good. It was full of flavour with a generous amount of ingredients. When my burger first arrived, I had to think of an action plan on how to eat it as I could not open my mouth that big but nevertheless, I got my hands down and dirty and ate like no one is watching. It was pure goodness. 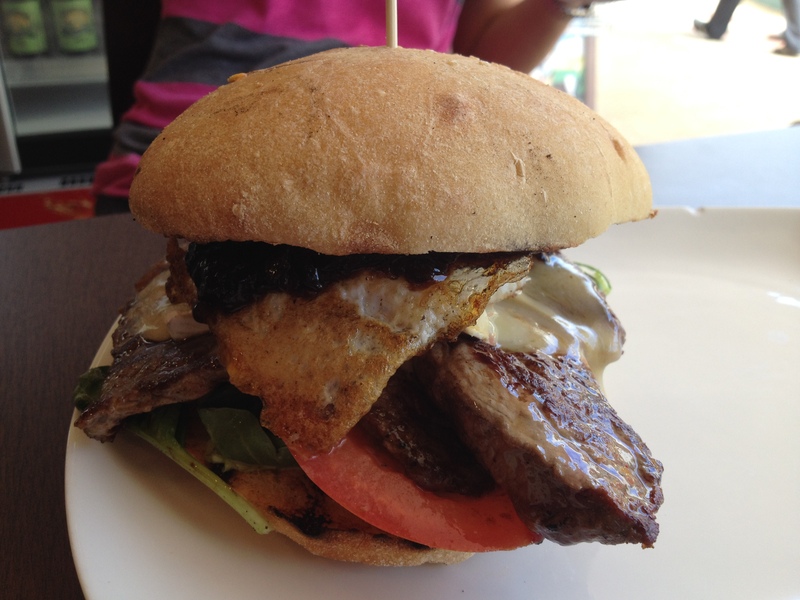 Mum ordered the Eggy Steaky ($16) which consists of a juicy and tender steak, creamy Tasmanian brie, fried egg, Spanish onion jam, tomato, mixed gourmet lettuce and aioli. 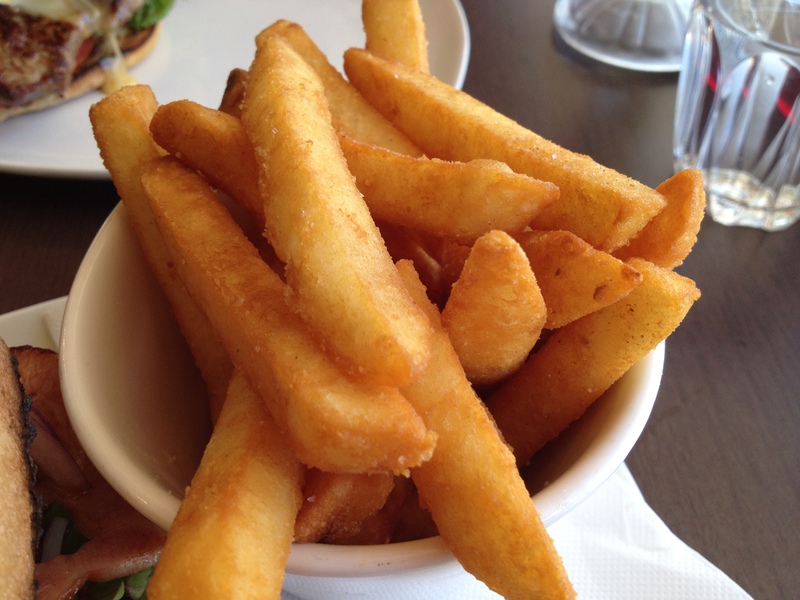 To accompany our burgers, we also ordered a side of battered chips ($4). According to mum, she really enjoyed the Eggy Steaky and thought that it was very tasty. Just like the F.B.A, it was generous in portion.